As you probably know Marks and Spencers homeware is my current addiction. 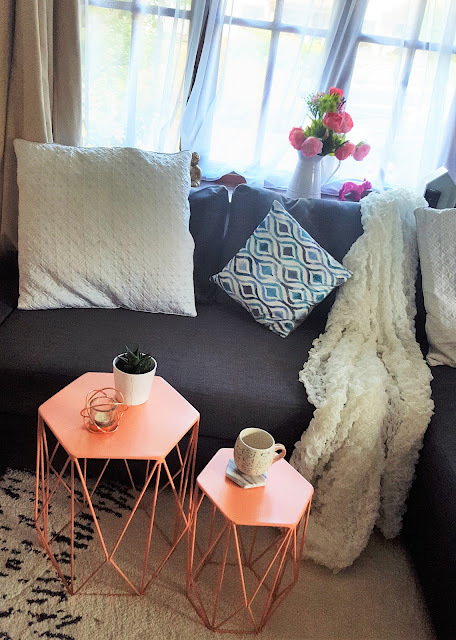 I've recently gone all out since having my own home - and recently purchased a Copper Arc Lamp for my lounge. When the team at Ocean Loans got in touch and asked me to collaborate with them and update my lounge even more, I couldn't say no! Ocean Loans offer mortgages, Credit Cards, and Insurance - they really are the one stop shop for all your home requirements. I'm slightly addicted to geometric patterns, and Marks and Spencers new Loft Range just gives me pure joy! 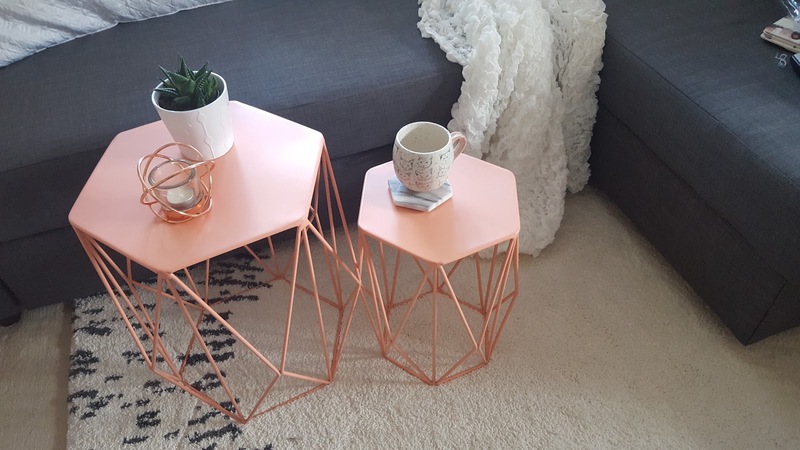 These wire nest of tables in Coral go with all my throws and my Oliver Bonas Cactus table and chairs. I have avidly watched Marks and Spencers interior design, and more and more Scandi style furniture is coming up. What I loved about these table were the fact that they are easy to transport around my home, neatly stack inside one another, and make a little chair for when my lounge is full of my friends. The Wire nest of tables come in Grey, White, Coral and Mint - for £79.00 'Here' I simply adore them. 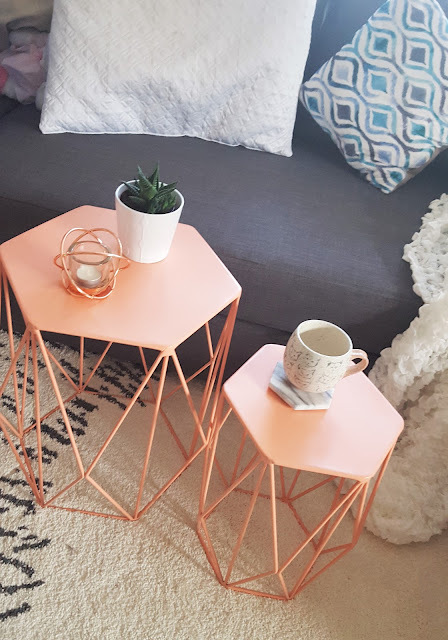 Everyone that visits my home, loves how I can easily move the tables from room to room, and from a cuppa tea, to my laptop to my many many succulents they are just so versatile and house whatever you want to put on them! 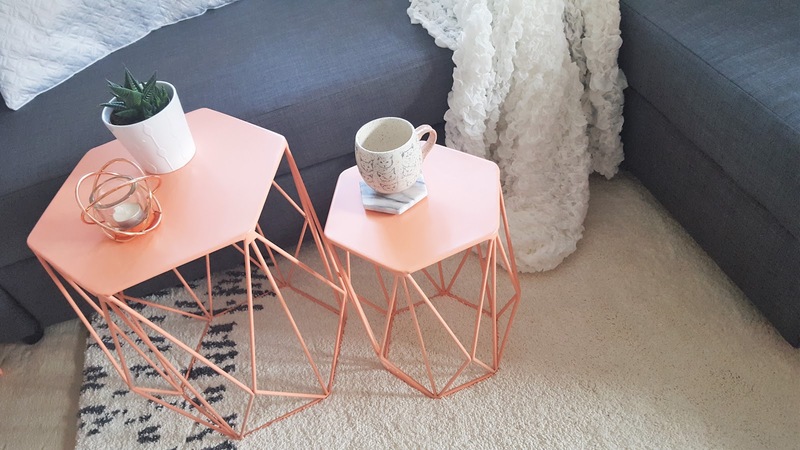 Do you love Geometric homewares as much as me? Thanks to Ocean Loans for letting me collaborate with them on this blog post. I have them in grey although now wish I had a different colour so may spray paint them in copper!